‘…these songs have come out of my own journey, particularly of the last seven years of learning the life-giving power of hearing my own voice and the voice of other believers around me declare what is most true and most real. What God says is true — even when pain, doubt, grief and confusion are very real as well. There’s an incredible power in agreeing with each other, and especially with God…’ Steven Curtis Chapman needs no introduction. After a career spanning for more than 20 years, first on Sparrow Records and now on Reunion Records, Steven’s ability to deliver musical poignancy and heartfelt encouragements time and time again has been nothing short of exemplary. Quite possibly one of my favourite Christian male artists ever (on par with others like Phil Wickham, Paul Baloche, Chris Tomlin and Tim Hughes); Steven’s journey through adversity over onto the other side with confidence in God’s providence for his family is a testament to the power of hope and trust in our Father. While no one wants to walk through what Steven and his family ventured through way back in 2008, what Steven has delivered in the albums since his daughter’s death have been such where we have witnessed the work God has been undertaking in not only his own life but in the lives of the Chapman’s as a whole. His latest work Worship And Believe is Steven’s first all-out vertical worship album, and with 11 studio tracks and 6 live recordings; we witness one of the most powerful and compelling worship album displays, quite possibly one of my favourite worship albums in 2016, and my favourite album of 2016 (alongside Meredith Andrews’s Deeper). 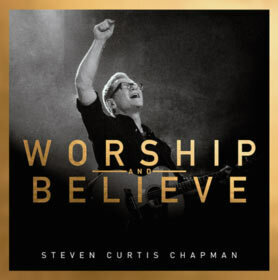 From the identity affirming “We Believe” (not the Newsboys hit but still up there theologically and lyrically) to “Amen”, Steven’s first radio single co-written with Rend Collective, and “One True God”, a duet with popular worship artist Chris Tomlin; this collection of songs is a must have for any Steven Curtis Chapman fan, for any worship music fan, for any fan of Christian music in general, and for any fan of music with an encouragement umbrella that reminds us all of our Father and Friend, whom our belief in is not in vain as we see the work God is doing in our lives and in the lives of others we meet on a daily basis. Releasing his first single “Amen” in September 2015 (and also delivering a live version of the song that is just as moving and emotional as the original studio recording), this song co-written with Chris Llewlyn of Rend Collective is by far one of my favourite worship songs I’ve heard since Lincoln Brewster’s “There is Power” and Lauren Daigle’s “First”. Embedded in Scripture and giving us a reason to declare our praise and adoration to our Father, Steven begins the song with a light acoustic guitar in the background as the poignant words of how ‘…You have given us a new name, the sons and daughters of Your righteousness…’ echo through the listeners mind, even mine. We have been called new, holy, acceptable and blameless once we have accepted the free gift of salvation and eternal life through Christ’s death and resurrection. And once we have really, truly, fully reconciled the fact of our sinfulness and dirtiness coupled with the saving by Christ who submitted Himself to death (and resurrection) on our behalf, we can’t really say much, and the words ‘amen’ ought to be just the tip of the iceberg of the amount of accolades and praises we will say to our Father ought of our grasp and understanding of grace given freely by Christ Himself. The song “Amen” is all of our feelings about God’s sacrifice into song. It is what God says we are, even if we don’t believe it ourselves- ‘…You say we are loved, You say we belong to you, Your grace is enough, nothing more that we can do, You say we’ve been bought by your blood, by your blood, and all that we can say is amen…’ This is the chorus of a song that has quite possibly been a cornerstone of my worship experience for a while now. Steven’s new venture into worshipful music is not without its nuances and hiccups (quite frankly, lovers of Chris Tomlin may enjoy this album a bit more than some of the die-hard SCC fans), yet Steven has boldly written the album that reflects where his heart is at right now- worship. “Amen” is a powerful first single, and one that has been in my iTunes playlist for a while. “Amen” is a great representation of what Worship and Believe has to offer…who knows, maybe “Amen” will receive a Dove Awards 2016 nomination for Praise/Worship song of the year? “We Believe”, “One True God”, “Who You Say We Are”, “Sing For You”, “More Than Conquerors” and “God of Forever” are some of Steven’s highlights on Worship and Believe, and all have been released to the public, whether it has been through iTunes, through live videos on Youtube, or even through Essential Worship song session videos, as we see the vast expanse of Steven’s songwriting ability in each of these melodies aforementioned. “We Believe”, not unlike Newsboys’s hit of the same name, is a song that ought to be declared in the midst of both trials and triumphs, as this song is a declaration of us believing in who God is and what He is doing in our lives at the moment. It is the chorus, surrounded by bold big drums and Steven’s affirming declaring voice, that encourages myself the most- ‘…we believe, we believe, You are God, we believe, we believe, You are good, You have conquered the grave, taken our sin away…’ A great song to sing out in Sunday morning worship services, “We Believe” is also a great reminder of who we believe in, especially in the moments of doubt and uncertainty. “One True God”, a duet with arguably the most prolific and influential worship artist of all time (i.e. : Chris Tomlin), brings to us one of the most lyrically profound songs from all of Steven’s career thus far. “One True God” asserts that there is just one- one hope, one healer and the one true God, as both Chris and Steven powerfully remind us all that there is ‘…one way to be saved, one lamb that was slain, one love, above all, there is no other, that can compare to You…’, and make this song also a favourite of mine on the album, and a song that I’m sure will be a comfort to many as they are presented with the truth of there only being one faith in which we place our trust in. “Who You Say You Are” brings the pace down a notch as the piano is brought to the forefront in a song that presents to us a theme of us knowing and believing into the fact that God is who He says He is, and we are who God says we are- blameless, holy, sons and daughters of the most High King, and heirs to the everlasting Kingdom that goes on until eternity; while “Sing for You” presents a light airy acoustic backdrop as this quick song of joy is that of immense fun and heartfelt emotion, with this song being a catalyst in which we sing and declare out our experience of joy with Christ Himself. “More Than Conquerors”, quite possibly a single from the album (dare I say single #2 after “Amen”), is by far one of Steven’s most musically and lyrically mature tracks on Worship and Believe. Though not to say that the other songs aren’t that flash, the matter of the fact is this- “More Than Conquerors” isn’t too fast or slow, the song isn’t drowned out by instruments, and it discusses a theme that can be more applicable and relevant in the wider community- actually believing that fact that we are more than conquerors, all because of God’s spirit living and residing within us, spurring us on to undertake good works as we express our love for God in whatever we do. “God of Forever”, the last remaining song to be presented in any shape or form prior to album release date, is a simple yet equally profound song about what God made us for- to love Him and to declare His never-ending nature, to sing and affirm the fact that the God of forever longs to and wants a real, honest, loving and transparent relationship with every person in all of creation. Though not as musically ingenious as “Sing for You” or even anthemic as “More than Conquerors”, “God of Forever” is nevertheless equally encouraging and enjoyable, and will be a fan favourite amongst SCC fans and fans of reflective worship music alike. Throughout the remainder of the album, we hear some powerful and imparting themes that Steven gives to us as we listen to songs that have been cemented by myself as some of the most honest worship songs I’ve heard this year thus far (alongside Meredith Andrews’s songs on Deeper). “The Body” is as rock as we can get from a Steven Curtis Chapman melody, as the song imparts to us the message of how we are the body of Christ, and that how we act and behave is a reflection of what we believe about ourselves and God Himself; while “King of Love”, though a little mellow for my liking, is as emotive as it is confronting, as Steven challenges us to undertake similar, if not greater things than our Father in heaven, because the king of love has given us the Holy Spirit, as we are filled up with God’s presence and we go out to share our faith with those who meet. “We are Listening” is a song for anyone who longs to hear God’s voice and presence as we continue to seek more of His will each day, and is much needed for anyone who may want to know how to tune into the voice of God in a whole full of noise and distraction; and “Hallelujah, You are Good” is a duet with Matt Maher (though I could only hear him as a backing vocal), while the song is much more powerful and a testament to how God is good in all circumstances, no matter what we may see in front of us or whether God has a bigger plan in store along the road. Releasing on the same day as other well-produced albums from Charles Billingsley, Propoganda and Newsboys; Steven’s 19th studio album and first full-length worship album is commended and applauded by myself, and hopefully millions more come release day. One of the most heartfelt and emotional worship experiences I’ve heard since Lauren Daigle’s How Can it Be and Meredith Andrews’s Deeper; Steven has imparted to us a sense of hope, trust, happiness and encouragement in this Reunion Records album release. Steven’s desire to release a worship album has stemmed from and out of Steven’s daughter’s passing, and with this album now releasing, his dream of presenting a set of songs focusing on the glory of our Father is shown in the urgency and passion of these tracks. Worship and Believe is a masterpiece, and as the months roll by, fans of SCC, worship and fans of music in general will continue to play these tracks (I know I will!). From Speechless, This Moment and Declaration, to The Glorious Unfolding, Beauty Will Rise and All Things New; Worship and Believe is yet another album full of poignancy and comforting words and Steven continues to present to us reasons why he still carries a mantle of one of CCM’s most prolific and sustainable songwriters of CCM history. Well done Steven Curtis Chapman for such a wonderful and rewarding album experience, one that will be enjoyed and cherished by myself in months, years and decades to come!